TextXD brings together researchers from across a wide range of disciplines, who work with text as a primary source of data. We work to identify common principles, algorithms and tools to advance text-intensive research, and break down the boundaries between domains, to foster exchange and new collaborations among like-minded researchers. Talks will range from the theory of NLP and deep learning to applied analyses or new software packages. REGISTER by November 25 - Registration is free, but pre-registration is required due to limited seating. Registrants will be accepted via email confirmation on a space-available basis. DRAFT AGENDA - This page is being updated as more speakers are confirmed. 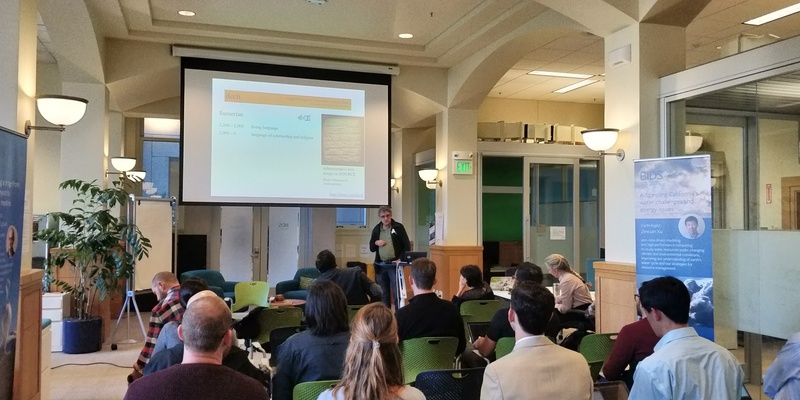 Wednesday, Dec. 5th : Training workshops - "Intro to Text Analysis"
This event is hosted by the Berkeley Institute for Data Science (BIDS), and co-sponsored by the D-Lab, UCSF Bakar Computational Health Sciences Institute, and the UC Berkeley School of Information. Christopher Hench was a BIDS Data Science Fellow and a PhD Candidate in German Literature and Medieval Studies at UC Berkeley from 2017 to 2018. He studied computational approaches to the formal analysis of lyric and epic poetry, and reading soundscapes. More broadly, with a particular interest in the challenges of domain adaptation for NLP and algorithms for the detection and scoring of text reuse. Christopher was also the Program Development Lead for Digital Humanities at Berkeley and the D-Lab at Berkeley, where he collaborated in several research projects and taught Python and Git workshops. He also coordinated the modules development effort in cooperation with BIDS, D-Lab, and the Data Science Education Program DSEP. Deborah Sunter is an Assistant Professor of Mechanical Engineering at Tufts University. While at the University of California, Berkeley, she was a BIDS Data Science Fellow and a postdoctoral fellow in the Renewable and Appropriate Energy Laboratory. Her research interests included data science for sustainability, national energy planning, city-integrated renewable energy systems, environmental justice, and clean technology innovation. While working on her BS in Mechan­i­cal and Aero­space Engi­neer­ing at Cor­nell University, she developed a nanosatel­lite mis­sion that was suc­cess­fully launched into orbit. Although fas­ci­nated by aero­space applica­tions, the time-​critical issue of global warm­ing shifted her focus in grad­u­ate school to explore renew­able energy. Spe­cial­iz­ing in com­pu­ta­tional mod­el­ing of thermo-​physics in mul­ti­phase systems, she devel­oped a novel solar absorber tube and received her PhD in Mechan­i­cal Engi­neer­ing at the Uni­ver­sity of Cal­i­for­nia, Berke­ley. The need for better global envi­ron­men­tal solu­tions led her to do research abroad in both Japan and China. After receiving her doctorate, she advanced her understanding of energy policy as an AAAS Science and Tech­nol­ogy Pol­icy Fel­low at the U.S. Depart­ment of Energy.